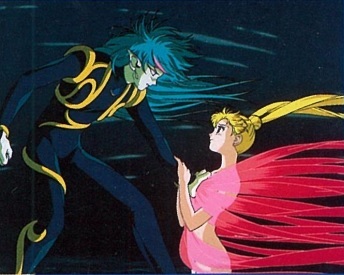 It’s been a long road here, but we’ve finally made it to the end of our three part special, where we review Director Ikuhara’s notes explaining his thoughts on the story of the Sailor Moon R movie. You can find Part 1 and Part 2 here, respectively. If you’re new to this series, a little background: Kunihiko Ikuhara1 was the director and major creative force behind the Sailor Moon R movie. Included with the LaserDisc release of the movie was a six page summary of his “interpretation” – basically, his thoughts and inspirations – of the story, separated by chapter. Today, I’ll be finishing up with comments 17 through 22! Why don’t you join along? Despite their best efforts, the Sailor Soldiers are finally captured by Fiore/Xenian and their army of flower monsters. You know, just saying that sounds really awesome. But I digress. Ikuhara comments that he took this as his chance to show why it is that the Sailor Soldiers fight – why they’re willing to throw their lives on the line for Sailor Moon, and what it is that they’re trying to defend. Apparently, while the movie was still in development, there was still no solid word on whether the series would continue on for a third season, so he thought that this was his chance to explore that. He also took this opportunity to combine Fiore and Xenian’s designs, to visually show how they’re interconnected. Here, Ikuhara describes that his his goal was to explore the concept of ‘loneliness’ and what it means to be all alone. According to him, loneliness isn’t about being ‘alone’ right now. Rather, true loneliness for people is about thinking how you will continue to be alone from here on out. If we were to extrapolate that out, I guess it could explain away how Fiore was okay with being alone for so long because he always knew that the feeling would eventually end when he returned to Mamoru, but after finding Mamoru and being faced with rejection and the concept of being alone forever on, he snaps. … yeah, okay, I don’t buy it either. But it is interesting what he thinks about the human spirit and conquering being alone. Oh, huh. Looks like I didn’t need to refute the point – Usagi was ready to do it for me! The final battle takes place in a garden of monstrous flowers. Enemy A believes that the only way to make the world into his ideal is to blanket the Earth with these evil flowers. However, these flowers will bring about the end of the planet. At the end of a desperate fight, Sailor Moon and the Sailor Team have emerged victorious. The garden of evil flowers is destroyed, and the surrounding is an desolate wasteland. 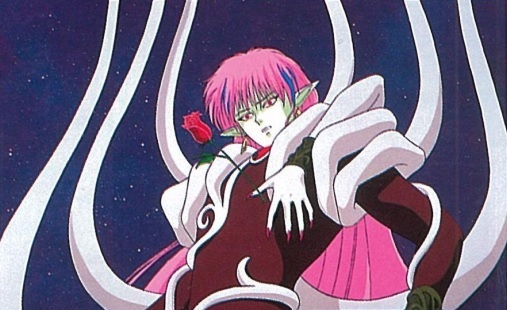 Enemy A, having lost his flower minions and his dreams in ruins, summons all his might and launches his hand through Sailor Moon’s heart! She’s in pain. Her transformation fades, and large ribbons start to grow out of her, to form into the shape circlet of flowers. But why? Where did all these flowers, whose hopes had already been destroyed, come from out of this desolate wasteland? Enemy A is in shock. Who is this woman standing in front of him? Alas, Ikuhara doesn’t finish his thought here. But I, for one, would have loved to see this cut of the movie. Even if the near death of Sailor Moon would likely have been pretty traumatizing for young fans. He notes that many people have asked him about this conversation, specifically why Usagi says “congrats” (おめでとう; omedetou)2 at the end. Ikuhara says that the reason behind that line is the key to the conversation. 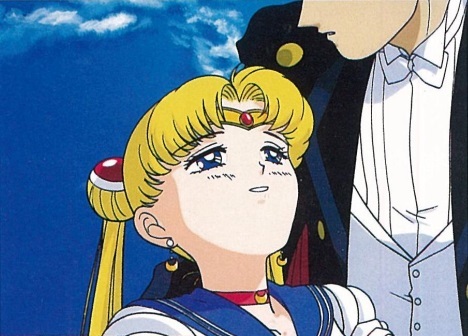 Read also: Does Naru Know That Usagi Is Sailor Moon? So what does it mean? Unfortunately, Ikuhara provides no further hints, and I’m quite possibly too deficient in my ability to analyze stories to find any deeper meaning here. I mean, I always assumed that Usagi meant it as a furthering of her congratulating her mother on bringing out a new child into this world. 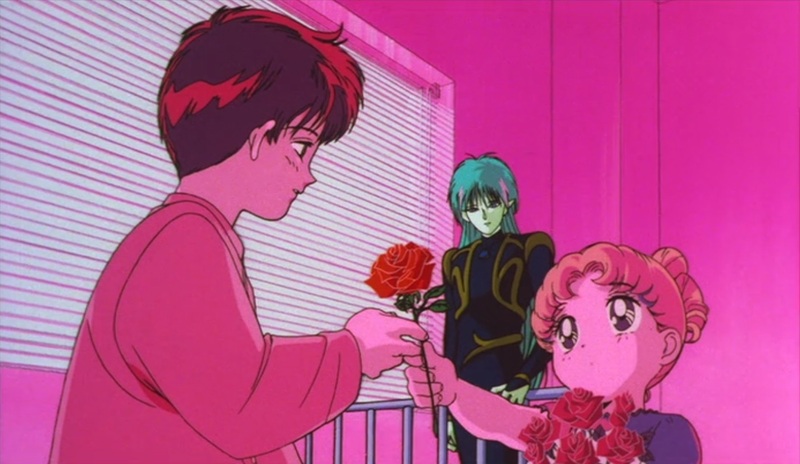 But I guess if you want to look at it from another angle, maybe Usagi is congratulating Mamoru on… his next step in life on losing a friend and growing as a person? Dunno… I just don’t see any deeper meaning here. Do you? Here we find Ikuhara going on to explain how Usagi is depicted as the ideal of motherhood, but not to be mistaken with someone who will forgive anything and everything. She feels strongly, and she both empathizes and sides with her friends, and has absolutely no sympathy for those who are pathetic and won’t do anything for themselves, like Fiore. He feels that Moon Revenge expresses this part of Usagi’s personality well. Aaaand, I’m not totally sure what part of Moon Revenge he’s thinking of, but I never really saw it as portraying Usagi in a really “independent woman” light. But then again, I’m not very good at interpreting art, so what do I know? Closing up on Ikuhara’s director’s notes, he discusses the idea of a flower of life. Much like how all of the flowers from the asteroid, and the hopes and dreams of human-kind, all came together to give Usagi the energy she needed, he goes on to thank all of the staff who made this movie possible. Read also: Why Is There No Sailor Sun in the Sailor Moon Universe? 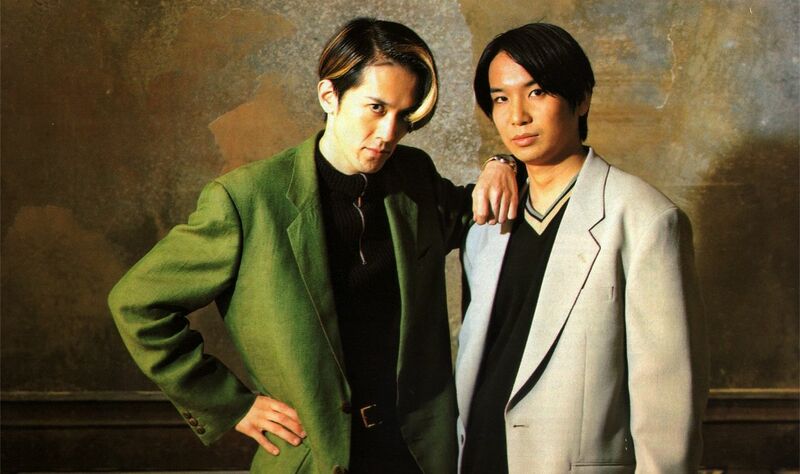 Throughout the process of making this film, various members of the production staff approached Ikuhara to discuss how they wanted to make their dreams a reality through their work on this film. Their work, in his words, were akin to the energy that came to Usagi to bring life to her and the Sailor Soldiers. And that brings us to the end of our review of Director Ikuhara’s notes on the Sailor Moon R movie! What did you think about all of this? Did he do a decent job getting his thoughts on the story across through the imagery and storytelling? Or was he totally off-base? Personally, I think he has some interesting ideas here on the characters and their motivations, but I feel like some of them were shoe-horned in, or might have gotten phased out during script rewrites, thus kinda invalidating his original intents and motivations for the characters. But that’s just my opinion – I’d love to hear yours! I can grasp what Ikuhara was overall going for. But I think we have to accept, that whatever a director originally envisions rarely makes it intact to the finished product. On a final note, the ending scene where the girls all gather round (and Rei hugs) Usagi never fails to hit me right there. I guess that sums up the core appeal of Sailor Moon for me. The entire concept of the series is completely ridiculous in all fairness. But it has a genuine heart to it, that just brings out my inner softie. I love this series of articles! R movie is my favourite. When I watched it for the first time in 2010 I replayed final scene about twenty times… Now I can recreate it from memory and there is no as strong emotions as for the first time. Some of Ikahura comments are a bit hard to understand for me, too artsy, I guess? I wish he described Mamoru and what hee feels about character a bit longer, it would be nice to know what the directir REALLY feels. Not those rumors about him “hating” the character. For the first photo, I’m just curios… I’m the only one who think fandom in-jokes about Mamoru clothes had gone too far? Personally I’ve never carried about his wardrobe. Just didn’t think about it while watching. It’s not high fashion but it is really not that bad, average for 90s. Blazer-turtleneck combo remind me of outfits of those intellectual types in old movies and it fits Mamoru. For the most part, I actually think Mamoru’s style is pretty cool. I know it’s cool to hate on him, but only 2-3 of his outfits were absolutely cringe-worthy. Particularly, that white shirt with the rolled up sleeves and eye/squiggle on it. That was awful. But outside of that, when you consider the time the anime was from, his clothes were actually pretty “cool” at the time. I mean, back in 1992, people in America were just starting to grow out of MC Hammer Pants, huge shoulder pads, and Tom Selleck mustaches. I agree with you 100% on the fashion sense thing. I never thought his fashion-sense was bad outside of a few weird one off outfits (the one from the curry episode in R and the odd 3 color pastel t-shirt in season 1). I hate when Viz makes gags about clothing or random stuff like that. Mamo’s regular outfit doesn’t look bad to me anyway. The script writers need to stop thinking they’re funny by adding in forced memes. Every character has outfits that are dated but bringing them up really takes me out of the emotions of the episode. In many ways he did get his idea across. Although as even with the television series some things just do not make sense to me. I guess Fiore was also just upset because it appears Mamoru kind of forgot him upon their first meeting. So maybe that also made him angry. I saw the movie again recently, but I do not see why the soldiers feel like they need to protect Sailor Moon. I always just thought they wanted to defend people and protect them. I guess they protect sailor moon because she is their friend. Unless there was another reason I did not pick up. I think it actually makes sense his thoughts about loneliness. I think being alone and being lonely are different though. That scene that he outlines seems interesting, but he does not even finish what it was. He should not have ended it there. Better yet he should not given us an outline. It would have been nice if he told us the reason behind that “congrats” line. It is pointless to bring up that there is a reason, but not tell us what it is. I think maybe like you said it’s like congrats to her mother or that Mamoru is moving on in life. If it is towards Mamoru moving on though it seems way out of character and she seems rude for almost not acknowledging what he told her. It just seems like a awkward scene overall. Usagi seems out of character if she meant congrats on losing a friend and ignoring what he said. I do not see Usagi as someone who will not have sympathy for people who are pathetic and will not do anything for themselves, like Fiore. It almost seems she is always having sympathy for everyone. No matter how ridiculous they can be. Like her forgiving a lot of enemies. Maybe I have a different interpretation of Usagi than the director does. She seems almost too forgiving at times. The moon revenge song I looked at the lyrics(the translated lyrics), I do not see what makes Usagi an independent woman either. Ikuni always says that kind of stuff… Very vague, always pointing a “key” of his most confusing moments (Miki’s stopwatch, The Penguindrum)… But I like the way he keep people interested in his vision, even many years later. My thoughts on the scene of young Mamoru and Usagi… Well, it may be symbolic and the “Congratulations” may not be for Mamoru. So… for those of us who are daft, what is the point?? I don’t think there was any deep meaning behind the omedetou. How old was Usagi? 2 years, if old 3 years. She probably didn’t understand half of what Mamoru said, especially as her mind was just focused on her new baby brother. And the omedetou was probably just a repetition of what she heard people say to her. You know, kids that small say the darnest things. Mine did, too.